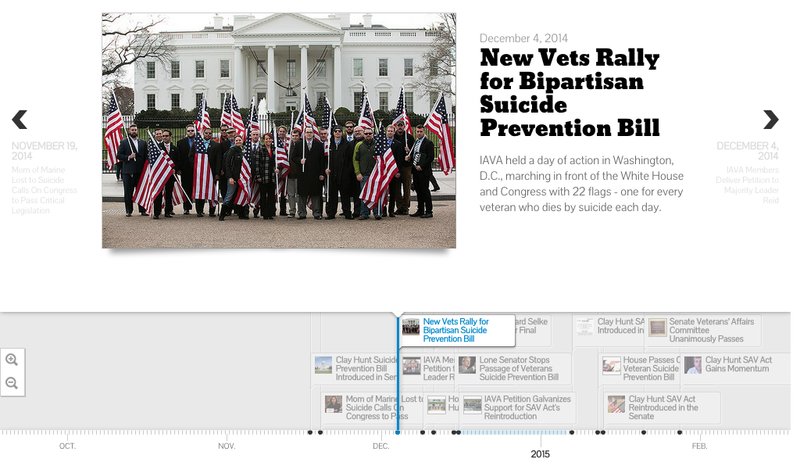 Click here for our new SAV Act Timeline. The Clay Hunt Suicide Prevention for American Veterans (SAV) Act will help reduce military and veteran suicides and improve access to quality mental health care. Increase access to mental health care by, among other things, creating a peer support and community outreach pilot program to assist transitioning servicemembers as well as a one-stop, interactive website of available resources. Better meet the demand for mental health care by starting a pilot program to repay the loan debt of students in psychiatry so it is easier to recruit them to work at the VA.
Boost the accountability of mental health care by requiring an annual evaluation of VA mental health and suicide-prevention programs. The House version of the SAV Act (H.R.203) was re-introduced on Jan. 7, 2015, by Rep. Tim Walz (D-MN1), House Veterans Affairs Committee Chairman Congressman Jeff Miller (R-FL1), and Rep. Tammy Duckworth (D-IL8). On Jan. 12, the bill unanimously passed the House and was sent to the Senate for consideration. The Senate version of the SAV Act (S.167) was re-introduced on Jan. 13, 2015, by Sens. John McCain (R-Ariz.) and Richard Blumenthal (D-Conn.) and 18 co-sponsors. On Feb. 3, the Clay Hunt SAV Act unanimously passed the Senate by a vote of 99-0. On Feb. 12, the bill was signed into law by President Obama at a ceremony at the White House. 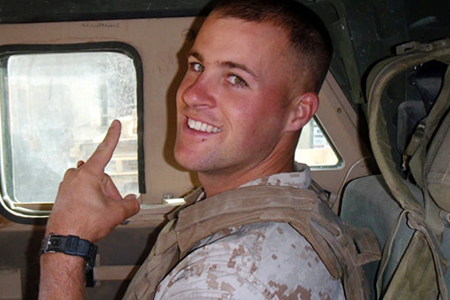 Clay Hunt was a Marine veteran who died by suicide in March 2011 at the age of 28. Clay enlisted in the Marine Corps in May 2005 and deployed to Anbar Province, near Fallujah, in January 2007. Clay was shot in the wrist by a sniper’s bullet that barely missed his head, earning him a Purple Heart. Clay recuperated at Twenty Nine Palms, CA and then graduated from Marine Corps Scout Sniper School in March 2008. Clay redeployed to southern Afghanistan a few weeks later. His unit returned in late October of 2008 and he was honorably discharged from the Marines in April 2009. Clay received a 30 percent disability rating from the VA for his PTSD along with two smaller ratings for other health issues after separating from the military. After discovering that his PTSD prevented him from maintaining a steady job, Clay appealed the 30 percent rating only to be met with significant bureaucratic barriers, including the VA losing his files. Two weeks later, Clay took his own life. Five weeks after his death, and 18 months after filing an appeal with the VA for his PTSD rating, Clay’s appeal finally went through. 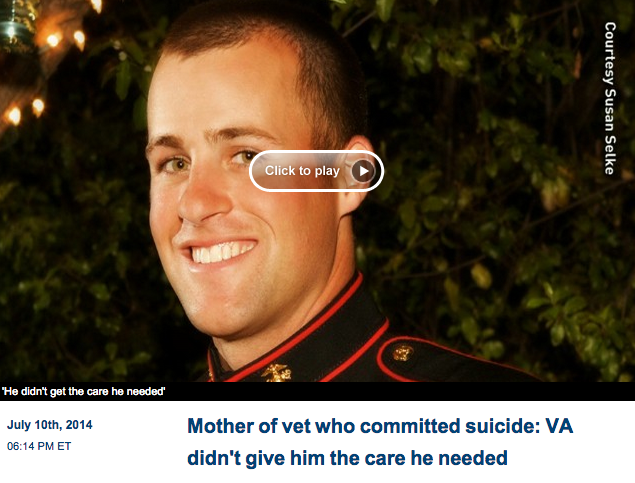 The VA rated his PTSD 100 percent. Clay was open about having PTSD and survivor’s guilt, and he tried to help others coping with similar issues. He worked hard to move forward and found healing by helping people, including participating in humanitarian work with Team Rubicon and participating in IAVA’s annual Storm the Hill advocacy campaign. He also starred in a public service advertising campaign aimed at easing the transition for his fellow veterans, and he helped wounded warriors in long distance road biking events. Clay’s story details the urgency needed in addressing these issues. Despite his proactive and open approach to seeking care to address his injuries, the VA system did not adequately address his needs.